When you’re installing or repairing a flat roof, it’s important that the materials you use are of the highest quality. Unlike a pitched roof, water will not naturally drain away as quickly as from a flat design, so it’s essential that you use flat roof felt, available to buy online from Ashbrook Roofing, which will protect the structure from the elements. Torch on roof felt delivers some of the best results in the roofing industy. Torch on roofing felt is usually made up of several layers of modified bitumen, which is designed to melt with the application of a heavy-duty gas torch. As these layers melt, the felt forms a bond with the surface of the roof, which is long lasting and watertight. If you’re working on a project that prohibits the use of a gas torch, which is an issue on some construction sites, why not take a look at our excellent selection of self adhesive roofing felt. As well as making sure you select a high-quality, durable felt, it’s important that it is installed properly to make the roof watertight. 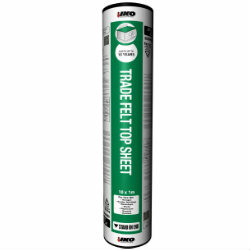 In addition to our range of felt, we also stock lead flashing which is suitable for sealing the joins between the roof and connecting walls. For instances when roofing felt turns up against a wall, we’d recommend using Code 4 Lead - although we’re happy to provide additional support or advice if you’re unsure about the materials you should be using. Simply get in touch with us for more information.